Normally you’re not allowed to walk on the freeway. Probably two exceptions are if your car has broken down, or if you’re wearing an orange vest and picking up trash. 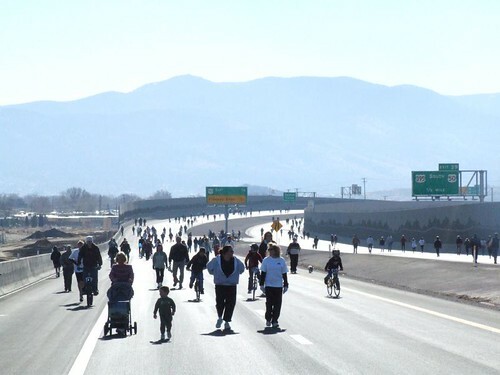 But last weekend hundreds of people got a chance to walk on the freeway. Luckily there was no traffic, and that’s because the freeway wasn’t open yet. 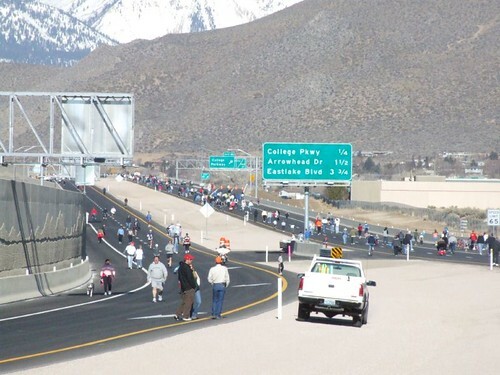 This was the public open house of the new Carson City freeway, a project that has been in the planning stages seriously for fifty years. 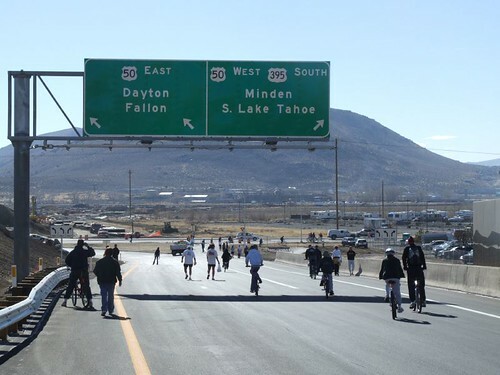 Opening day of the freeway is Thursday, February 16, and to gather excitement for the big day NDOT opened the four-mile stretch to pedestrians and bicycles for three hours only on Saturday. And there was really an excellent turnout. I’d say over a thousand people showed up just to walk and run along the twin ribbons of asphalt. The northbound Hwy 50 on ramp was the starting point, and from there you could walk all the way to Lakeview Hill at the far end of town if you felt like it. Personally, I only walked as far as College Parkway before turning around. But it gave us a good chance to look the freeway over while it was still sparkling clean, before it gets attacked by dirt and oil and rubber. …that never has an end. A lot of the freeway is surrounded by sound walls, so when we were walking we couldn’t get much of a view or a sense of where we were. We were just walking through a long, wide concrete canyon, with a hint of the mountains in the background. But once we got near College Parkway, out in the swamp off of Lompa Lane, the sound walls fell away and we could see the view. From the top of the College Parkway overpass we could look down on the cars passing by below, cars that were probably jealous that we could use the freeway and they couldn’t. We were able to gaze across at the new Wal*Mart. We were able to see the Hot Springs. We actually, for the first time, could see the town from something other than ground level. A Wal*Mart in the distance. But even on Saturday, a few days before opening, the work wasn’t finished. A couple of laborers were raking rocks and putting final details on the on ramp landscaping. And workmen were sanding the concrete on the Hwy 50 bridge. But for the most part, the freeway is ready. 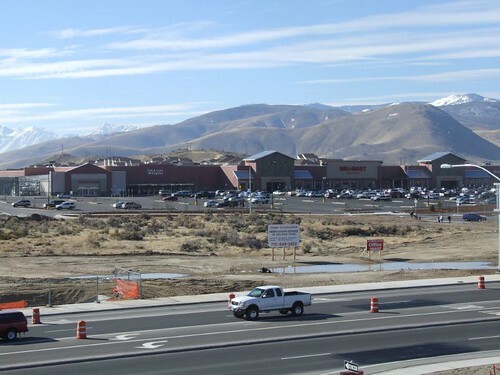 Soon 15,000 cars a day (estimated) will be zipping back and forth between Scolari’s and the hospital, and soon crews will be getting to work on the next phase of the freeway, extending the road from Hwy 50 to Fairview Drive. But for now, I put up 34 pictures from the day into a Flickr photo gallery, so you can go check those out. 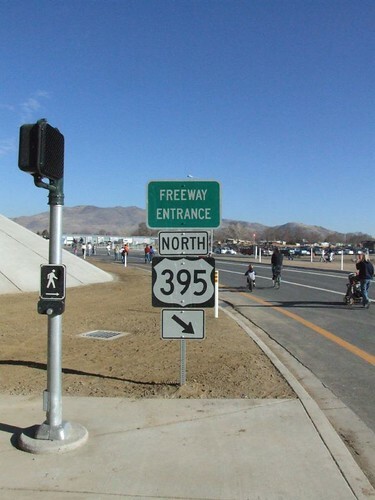 And in just three more days, we’ll all be able to drive on a real, live freeway, right here in Carson City.